book, it's the book that chooses us. If I'm honest, I've only seen The Hurricane once. It was kind of weird because I went in anticipating and therefore dissapointed that Liev didn't have a bigger role, but got so distracted by the whole issue of The Canadians that I was Googling and IMDB'ing the trivia/locations while the show was on. Kind of lost the gyst of the thing for me. Anyway, all this to say that I hadn't realized how much this had detracted from the picture or taken my eye off the ball which was (and usually is) Liev's performance. Until Monday when I received my copy of this week's New Yorker and saw that Rubin Carter was in NYC a couple of weeks ago promoting his new book. (Forward by Nelson Mandela!). I decided to give this film another go 'round with less A.D.D. eyes and try to pick up the nuances and subtleties of the thing. What I found was a really sweet and even performance from Liev which has you living the highs and lows of the thing with him. Above all, what you feel is this swelling of selfless cameraderie at what these people are willing to do to help their friend Lesra and therefore Rubin in turn. A couple of moments will leave you feeling teary, even on a good day. LOVED them all flashing the lights enthusiastically in the hotel across from the prison. And of course Liev's heartfelt little leap when the final verdict is read did leave my heart fluttering. If you can swallow that side of you which keeps asking "What's in it for them?" and just take it for what it is, you will enjoy this movie. Equally as important, Liev's character of Sam (well, all three of them, really) seem to be inspired by reading and learning and consider it crucial. They are encourageing and promotive of books and furthering your mind and fostering human potential. These are important themes. 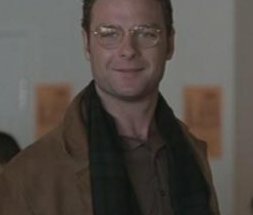 At a much more base level, if you're into seeing bookish Liev in glasses, plaid bathrobes and corduroy, this movie's like he stepped right off the set of The Paper Chase . Hotness! Grr~! Yet another movie of his I haven't seen~! You evil ninja. And did you see that I posted my "account" in the forum?! Let me know if you want me to post it on the blog!